Happy Military Spouse Appreciation Day! In honor of the spouses that work so hard on the home-front I've compiled a list of 101 Ways to Thank a Military Spouse! Take the time to *listen* She may not have had an adult conversation for quite some time! Don’t assume HE is not a military spouse. Thank the military-husbands too. Give her a call! Say ‘Thank You’ and find out how her day is going. Business-owners: Host a special event just for spouses, don’t do it for monetary gain. Plan a play-date at your house. Get the kids together and enjoy the day. Sit with him at church. Not many enjoy sitting in the pew alone. Take a picture. Send it in an email to her. Give her privacy if you sense she does not want to open up. Send her a quick note (on hand-made stationary if you are feeling crafty). Say Thank You with food. Its the way to our heart! Send her an email, let her know you miss her if you haven't seen each other in awhile. If you haven't seen her for some time because of distance look at the calendar. When can you visit? Don't always expect her to do the travelling home. Get excited over something he is excited about! Take her children to the park. Ask if she WANTS to come to. Some spouses like time alone; others want adult-company. It might just depend on her mood. Give him a genuine smile; remember, a smile is worth a thousand words! Call her up. Ask if she wants to go out and get some ice-cream! Run across a funny comic-strip or joke that reminded you of him? Clip it and send in a letter. Do you see a new face in the crowd? She might be a new-spouse. Go over and introduce yourself. If a seasoned-spouse does something that makes you feel welcomed, say Thank You. It'll make her feel good, too. Don't assume she knows that you appreciate her sacrifice as a military-spouse. Say it. Organizations: Host a special military-spouse tea. It doesn't have to be 'fussy', just fun! If you are standing in line at the commissary and she is behind you with a cart full of food, fussy babies & screaming toddlers let her go in front of you. *Everyone* may say Thank You. Say good-things about her spouse, the service-member. It can feel like a reflection of her. Give her a list of things she has done for you. Take 5 minutes and make a list of 10 to 50 things you love about her. Make her a CD full of all the songs that remind you of her. Keep it cheery! Pick up a bottle of bubble bath. Deliver it with a small note of appreciation. Respect her decisions. If she says she can't do it let her 'no be no'. Go to an art-class together. Many bases have an Art-Shop, or find a local business where you can make jewelry or paint-ceramics together. Take him out to a ball game; either a local pro- or semi-pro. Buy him a beer and a hot dog. And enjoy the evening! Are her kids sick? Is SHE sick? Offer to help. Bring over chicken-noodle soup. Run to the store for some 7-Up. Find out what she needs. Service-members: Help her with the laundry! Help put it away without being asked. Did she make a dish for a social-gathering? Compliment her. Ask for the recipe! Tell someone that is near you how good it is. Contact your local Television or Radio Station. Do *they* know it is Military Spouse Appreciation Day? Don't forget to say 'Please' if you need her. She is probably juggling quite a bit at once. She will appreciate being asked, as opposed to told. Take the time to find out how his weekend was. Where the family went, what they did, how his son's baseball game was. Show her politeness, thoughtfulness and helpfulness. Open the door for her, pick up something she dropped. Help her start a hobby. As an example, if you scrapbook offer to help her get started if she is interested. Service-member: Whisper sweet-nothings in your spouse's ear. Tell him how much you appreciate him. Help her children make an "I Love You, Mom" card. Get artsy with glitter and glue and construction paper. Make some cookies with your kids & have them deliver them. Teach your own children gratitude for our military-families. She will appreciate it. Do you make cards? Send blank ones to @cardsforheroes. They send them to deployed soldiers to can send a note home on - a treasure for a military spouse! We are social! Join us on Facebook. Invite him over for a game on TV. Sit back and enjoy a beer together. When cooking dinner, make enough for two families. Bring half to a military-family or invite their family over. Benefit Of The Doubt. A little BOTD can go a long way to show your appreciation for the military-spouse. Flexibility is the name of game. Be flexible in making plans. Things happen out of her control. Play a game of catch with her children. They may be missing the presence of a man in their life. Businesses: Have a special gift for all the military spouses that come through your door; a key chain, a nail file, keep it simple. Hit a mid-day movie together. Buy a large popcorn to share! Invite her to a bible-study at your church. What a great way to meet new people! Grab the strollers and take a walk together! Servicemen - Buy her favorite lotion and give her a back rub. Businesses - Having a special contest? Ask a military spouse to be a judge. She'll be honored. Service-member: Sign up for dance classes with your spouse. Do you have a friend you know she would enjoy knowing? Introduce them! Invite him over for a bbq on a Friday night! Businesses: Do you see the flash of her ID when she makes a transaction? Be sure to say Thank you for her service! Military Spouse in the family? Laminate a special card with the families' phone numbers, addresses, birthdays. Help her keep organized. Plan a girls' day... manicures, pedicures and lunch! Businesses: Encourage your colleagues to offer a meaningful military-discount. Make yourself a town that appreciates the military! Make her stop, breathe, and ASK "How can I help?" and then do it. © 2009 All Rights Reserved - MilitaryAvenue.com - Redistribute in its entirety only with permission. #47 is wonderful, what a treat and a gift to do for someone. 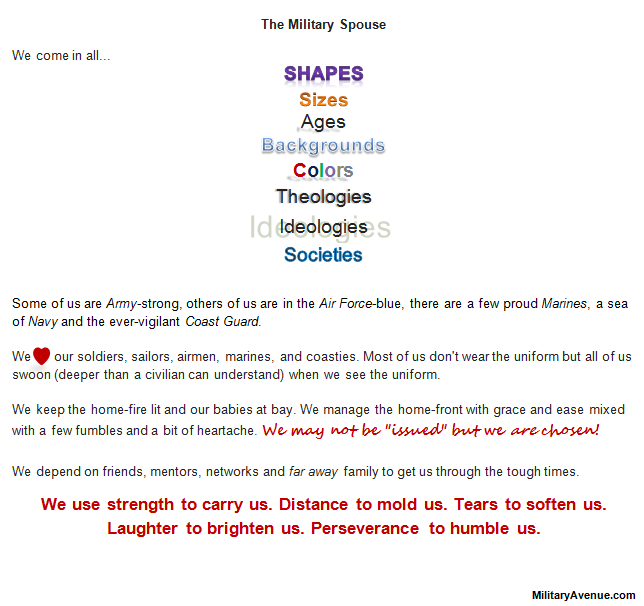 I reposted this to my LJ and DW and to the LJ comm mil_wives. This is great! Love THIS!! As a military spouse, I do love all your recommendations, though I think it's appropriate for any friends that you may have. Compassion & love is SUPER!! ;) Thanks for your post!! #4! THANK YOU! We are few in number (7%), but we are out there! Thank you for serving our country equally well as your spouse who may be on foreign land defending this country's freedom. God blessings to you always! Can someone please explain why military families have to give up their pets? Pets can be wonderful companions for children and mothers throughout this traumatic time. Is it the vet bills? My daughter and I would love to find a solution to this if that is the case. To respond to anonymous concerning military personnel having to give up their pets: There might be several circumstances why a military person has to give up their pet. First, a single service member deploying for a year with a pet can not take the animal with them, second a dual military family with both members deployed or on a long tdy and third for a family relocating while the service member is deployed and can not find housing that allows pets. There may be other circumstances as well but there is a solution that I recently wrote about! Guardian Angels for Soldiers Pet will help find a foster home and the pet is returned after the deployment! Please read and join to help! Here is the link: http://militaryblog.militaryavenue.com/2011/05/guardian-angels-for-soldiers-pet.html Thank you so much for caring! What a fantastic post! I love that Chocolate made it towards the top of the list. It must undoubtably be tough to be a military spouse and these are great ways to make everyday life a little bit brighter and not to mention more fun! Love the list, but I don't like that it continually says her. Men are left to holding down the fort as well. Hire the best UK Assignment Experts services by the professional and high experienced UK Assignment Experts at Students Assignment Help. We provide the best assignment writing services at a low price with timely delivery of the assignments. Our Assignment writers are available online 24*7. Do students search essay writing services? Don't search more; hire our expert to write your essay. We provide many services to write your essay and homework.